So I don’t know if you’ve heard of One Little Word – but essentially it is a way to focus on one single concept for a year, it is an idea started by Ali Edwards (scrapbooking maven) and lots of scrapbookers have gotten SUPER into the idea of focusing on one word to help shape what they are going to do through out the year. Well, last year I decided to get in on the trend (always a little late to the party when it comes to trends, but that’s just how I roll). I talked about it some in my Yay Me 2015 post, but for 2015 I chose the word “BEGIN” and I really did dive in and START so many of the things that I’d been putting off, it was an amazing year of a million awesome beginnings and I reached the end of December feeling really great about where I was and the journey I’d begun. 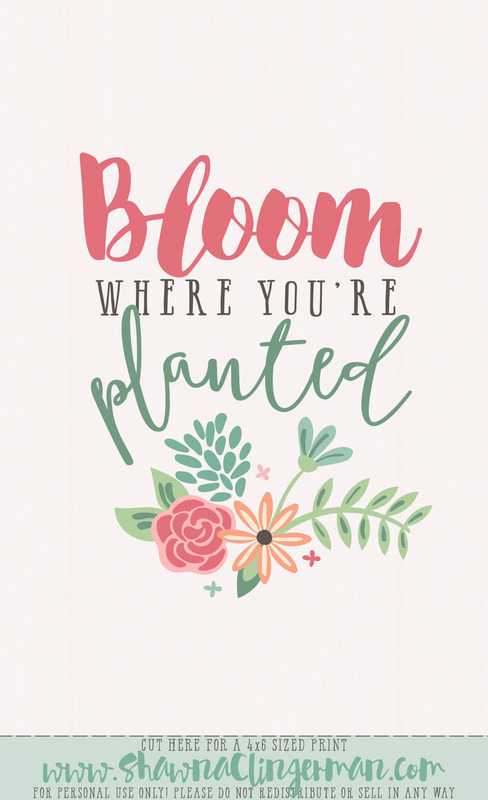 Well, as I’ve spent time in January pouring my time into art and learning and church and home (and myself), it sort of started to come to me what this year is going to actually be all about – I’ve started the process of growing and I began doing the things I’ve spent so many years dreaming of, and now is the time to Bloom. 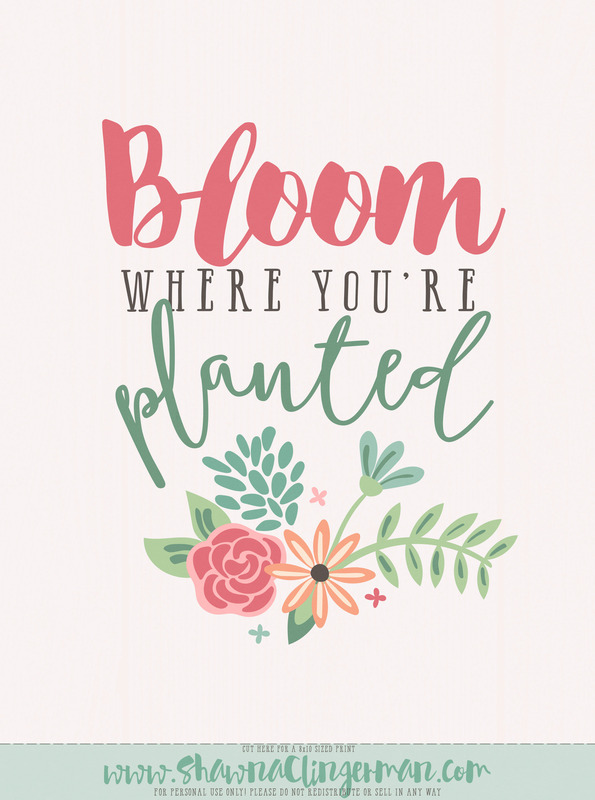 Instead of like “nose to the grindstone and FOCUS on making it all happen Shawna” it is like, “really soak it in and immerse yourself in these things you love and so you can blossom and grow”… I LOVE that! That is the message I want to send myself, that is what I want to be thinking as I fill out in my planner and fill in my days. 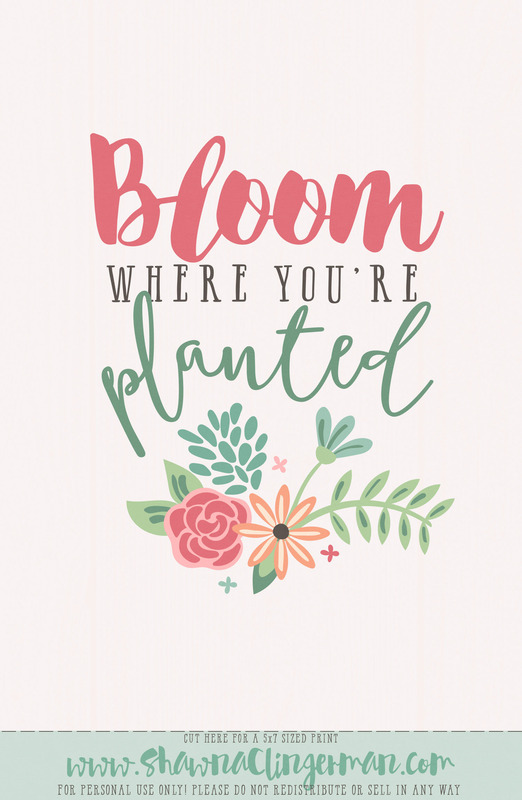 So, for 2016 BLOOM it is. It is a just a sampler to give you a little taste of my designs, so you can pick it up for free any time during the next year in the Shoppe at SSD – and if you likey you can check out the rest of my goodies that I have for sale! So, if I’m making one for me why not share it with all of you too! I went ahead and saved a version for print that is 4×6, 5×7, or 8×10 so that you can download it in any size you would like! This time I’m skipping the zip folder and just put the JPG images up themselves so that it is easy to do on a mobile device if you would like. To save to your computer just right click the image and say “save as”. For my personal print I just used on my home printer and photo paper at full quality and it came out beautifully <3 That lovely frame is a 5×7, one of my Goodwill Outlet find (LOVE that place!) When you download and print, just cut off the bottom bar that says “www.shawnaclingerman.com” and it should fit perfectly in the frame of your choice. If you send it to a printer just be sure to crop it before ordering it. Remember, you can go get the FREE kit in the Shoppe too and in it is a 3×4 sized print for your pocket scrapbooking, plus a bunch of coordinating goodies! Ok, that is all I have for you today! But I cant go before mentioning that this weekend is a big one at SweetShoppeDesigns.com! Not only is it our 10th anniversary kick off with brand new freebies from all the designers, but we also have a gorgeous site re-design we are revealing and a 30% off of EVERYTHING sale so take this opportunity to pick up something on your wishlist! Keep an eye on the shoppe and forums too because we have special events all month long AND I have 4 new releases up my sleeve! Stay tuned! Thank you so much for the different print versions of “Bloom”. I visited Sweet Shoppe this am just poking about and found your lovely free mini kit – so thank you so much for that too! Can’t wait to use it. The journal card really spoke to me. We have many decisions to make this year and our home is up for sale. Waiting for that one buyer seems to have put our life on hold – which is not a good feeling. Your Bloom mini made me realize I need to move on with life and quit waiting for the next home move. I will have the 4 x 6 print framed and posted in my office to remind me to ignore the For Sale sign and live for today. Thank you!!! Thanks, very pretty. Nice to have multiple sizes.